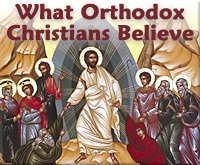 A comprehensive guide to what the Orthodox Church believes about a number of subjects including belief in: God the Father, Jesus Christ, and the Holy Spirit. The Orthodox Church is the Church founded by Jesus Christ and described throughout the New Testament. All other Christian Churches and sects can be traced back historically to it. The word Orthodox literally means "straight teaching" or "straight worship," being derived from two Greek words: orthos, "straight," and doxa, "teach­ing" or "worship." As the encroachments of false teaching and division multiplied in early Christian times, threatening to obscure the identity and purity of the Church, the term "Orthodox" quite logically came to be applied to it. The Orthodox Church carefully guards the truth against all error and schism, both to protect its flock and to glorify Christ, whose Body the Church is. An astonishing number of religious groups today claim to be the successors of the early Church. A "yardstick for truth" is needed by which to compare what the Church originally believed and practiced with what these groups proclaim. Certainly we all have the God-given right to believe whatever we desire and to participate in whatever religious association we choose. But it is also just good sense to be acquainted with the options before we make our final choices. It is our hope this material will help introduce readers to the Christianity espoused by the Apostles of Jesus Christ and instituted by them. This is the yard­stick for truth by which our choices in regard to Chris­tianity need to be evaluated. All Scripture quotations are from the New King James Version of the Bible, © 1979, 1980, 1982, 1984 by Thomas Nelson, Inc., Nashville, Tennessee, and are used by permission.